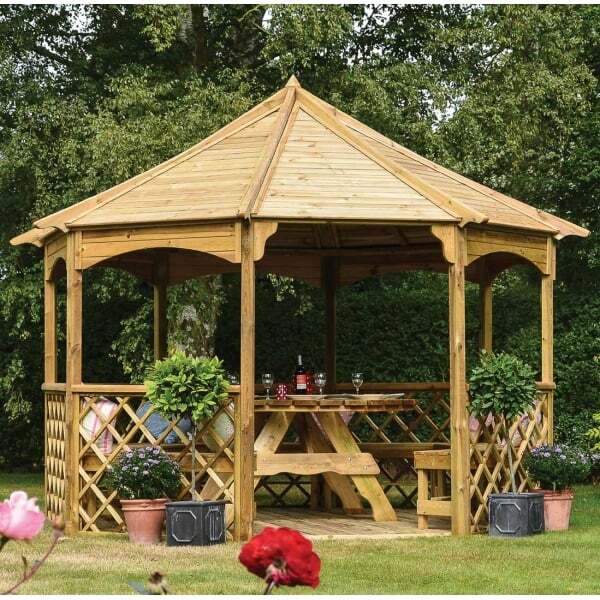 Rowlinson Buckingham Gazebo: The Rowlinson Buckingham Gazebo is comprised of natural timber finished wood floor, roof, and half-height lattice trellis with hand rail. An even-sided octagonal design, this attractive gazebo measures 3.57 metres in diameter. With a spacious interior, the gazebo creates an enticing sanctuary for outdoor relaxation, meals, or entertaining. Pressure treatment ensures the timber is well-protected and the elegant finish means that this charming garden feature requires minimal upkeep. The gazebo’s components, finished in natural timber with a light green tone, come with straightforward assembly instructions needing only minimal DIY ability. Note: Furniture shown in picture is not included.